All Content contained of the pages within this website is copyright Teaching Heart 1999-2005 by Colleen Gallagher, all rights reserved. We give you the permission to download, print, modify, and generally use the written material contained herein, we do ask that you respect our rights and not publish any material on this site without prior written consent. Please do not copy and paste content from this site onto your site. Thanks! Below you will find activities to match three of Kevin Henkes most popular books! The activities were shared by Teaching Heart visitors who entered the 2005 back to school contest. The winning lessons are seen below. Use the link to view some of the other lessons shared. Thank you to all that entered the contest! I am sure your ideas will be put to good use by many teachers around the world. Renee Liles was selected as the grand prize winner! A Teaching Heart Tote Bag to Carry All Your New Goodies in! Note: The sample CDROM will not contain the same files as the sample CDROM awarded to the Dr. Seuss Winners!!! I have attached sheets I made for story recall, counting sets, and sorting coins. You could put in "movie star sunglasses" and/or coins to practice coin recognition. 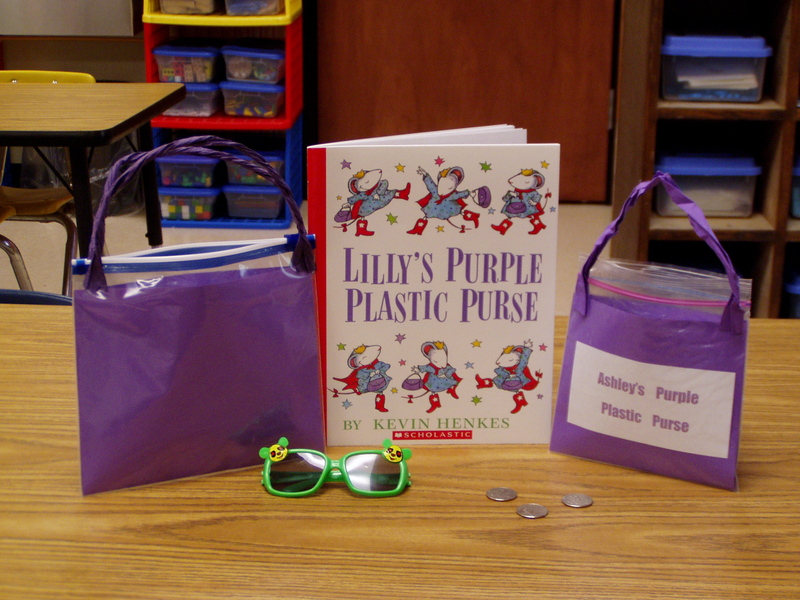 Students could draw pictures or cut out magazine pictues of what they would keep in a purse. I teach first grade and this is truly one of my favorite stories! I always share this story during the first few weeks of school. Student nametags are taped onto their desk. After sharing and discussing the story, Chrysanthemum, I go to the board and draw a box (to represent my piece of plain paper) then write my name at the top. I tell the students we are going to count the number of letters in my name. After this, I ask students to count the letters in their name then whisper it to their partner. I ask for volunteers to share how many letters they counted and call on several students. I can recognize which student(s) might need additional help. After students count and share, then I draw ___ and put space for each letter in my name on the page; we are counting my letters together and I am modeling what students are to do at the board while students count and watch me draw the blanks. Then several students volunteer for me to put their name on the board as another example. Each student is given plain paper. They write their name at the top of their paper. Pencils down. I ask students to count the letters in their name and again whisper it to their partner. Then model on the board what students with 2 letters, 3 letters, 4 letters, etc. and have those students to draw their blanks while we are working together then put their pencil down after they are finished. The only students who pick their pencils up are the ones with that number of letters in their name, and then I go to the next number. After all numbers are shared and their partner checks their paper to see if it is correct, I then pass out magazines, advertisement papers, etc. They are to find then glue the letters that are in their name on individual lines, in the correct order. After students have found the letters, they can then either draw a picture with the beginning sound under the letter or cut pictures from the magazines, advertisements, etc. We share our pages with the class and then we make a class book with the papers. The book is titled How many letters? When I make class books, I bound then with yarn or silver rings and they rotate home with each student until everyone has had a chance to share it with their family. I love to read the story Chrysanthemum by Kevin Henkes at the beginning of the year. It's a great story to read when you would like everyone to learn their names. After reading the story Chrysanthemum with my class, I always start a discussion about our names and what our names mean to us. I explain that at times, our names can even describe us. I model a free form map on the board with the name of Chrysanthemum,,,, or even better "Mickey Mouse". (They seem to know that character well.) Then, I have the children give me ideas of things they think of when they think of Mickey Mouse or what describes him. Immediately, the class starts participating and calling out...little mouse, friendly, pluto, Disney World, etc... On the board I write the name in the center and then I map out from the name. I tell the class they can either write words around the name or draw pictures that describe the name. Once I'm done modeling how to do a free form map on the board, I pass out a big sheet of white construction paper to the class and have them create a free form map around their names. Their maps always come out super nice, and bright. I tell the children that their maps must be in color and full of details. I tell them to draw or write things like where they were born, their hobbies, pets, friends, personalities, siblings, favorite color, etc... Here is an example of a free form map I made with my name just so you can see it and have an idea of what it looks like. Hope you like my idea, my children always seem to love it. It works great with 2nd and 3rd grade. I just wish I would have kept a sample from the ones my kids from last year. Using various sources on the web, I created two poster/transparency templates for Chrysanthemum. I also created a letter home to parents asking their for their help in an extension activity. Read the story to the class and chart ideas about times when students did something that they regretted. You may even want to share a time like that of your own. Send them to their seats and let them write about a time like that on the attached printable. You could copy it on purple paper to make it even cuter. Add different coin amounts (depending on your grade level) to the money page and have students practice counting money. Use the graphic organizer to talk about the story elements. Would you like to make lesson planning easy thisyear? Do your want your students to have fun while they learn? Then get our CDROMs & Packets Now!!! Save when you order all four CD's today! Order all Four CD's in one easy click & save US $4.40! Click above to order your back to school goodies.